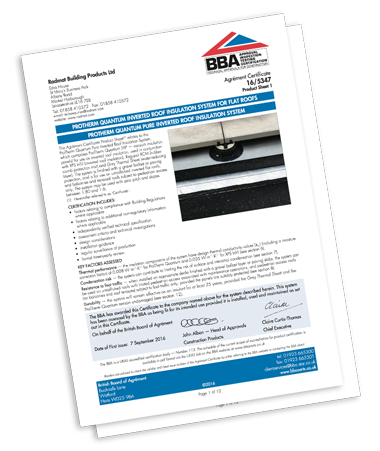 BBA Certification for ProTherm Quantum has now been released making it the world’s first BBA Certificated Inverted Roof Insulation. The result of a 2-year approval process the achievement of this landmark event will further strengthen the growth of ProTherm Quantum in the specification market, where the systems unique ability to meet the requirements of Building Regulations Part L, Part M and NHBC Chapter 7.1 whilst achieving threshold heights previously not possible is in increasing demand. Quantum is suitable for use with any waterproofing system BBA Certified for inverted roof applications.